Please read! Comic #1 found below! Since I began blogging in June, I have been writing and drawing with the intention of amusing (myself, my audience, etc. ), practising, and showcasing art and photography for those that might be interested in buying prints of existing work, commissioning new sketches/illustrations/photographs, and/or contracting me out for larger scale projects. While throughout this blogging discovery process, it is fair to say that several themes have emerged (art, photography, and social commentary being the main ones), it has been infrequent that similarly themed articles have been published in any sort of timely or consecutive fashion. For the sake of focus (yours and mine), I resolve to start (today) a 10-week weekly comic series touching on social/political issues. While I don’t intend to use recurring characters, if they show up, all the better. Per the comics, I will attempt to draw at least one per week. I have yet to decide whether I intend to draw them in b/w, color, traditionally, digitally, or vary my style as it seems fit. While I plan to advertise on FB, if this is going to get any real momentum, I imagine you (the readers) will need to be the main source of advertising. With this in mind, I promise to illustrate and provide reasonably interesting comics, but I am leaving promotion of all this (through likes, shares, emails, word of mouth, texts, tweets, etc.) to you. Ensemble, nous pouvons réussir! Finally, I will be looking for feed-back! While a simple “yay” or “nay” will suffice to show your appreciation of a comic, feel free to give more in-depth constructive criticism as the mood strikes you. Also, while I have written about ten words on scrap paper thus far regarding content, I am quite open to suggestion, so please let me know what social/political topics you would like to see broached. This entry was posted in Social Commentary / Other, Weekly Comics and tagged #1, comic, compulsory education, corporal punishment, doctor, Education Reform, engineer, lawyer, pederasty, plato, school improvement, socrates. Bookmark the permalink. 6 Responses to An On-Going Theme?!! I did not immediately see that the comic was yours and I could not see where I could leave a comment. Are you new at blogging? Do you know that most hits will come from Google images? 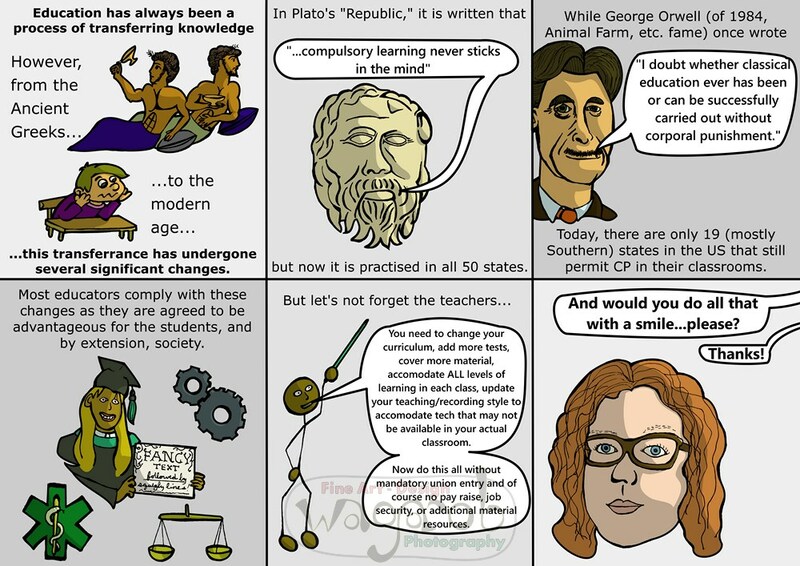 As to topics to be broached: your Plato quote about compulsory learning that never sticks. Why is it completely disregarded? Thanks for your input. I’ve been blogging for less than a year, so I guess I am still learning the ropes. I’ll probably start off the next post with the comic rather than place it further down. Per image ownership, of course the comic is my own! In fact, you’d be hard pressed to find any images on this blog that are not my own intellectual property. Per a friend’s suggestion, next week’s theme has already been chosen (what to do with DC’s current budget surplus), but perhaps after that I can come back and examine thoughts on compulsory education more thoroughly.